Andre’s knowledge of and passion for wildlife and birding helped inspire and shape his interest in photography from a young age. His favourite wildlife destinations include many of the Southern African reserves including the Kruger National Park and the Kgalagadi in South Africa, Hwange in Zimbabwe, Etosha in Namibia, and the Central Kalahari and Savuti in Botswana. While harsh and desolate landscapes are among his favourite, Andre enjoys spending time photographing all aspects of the natural world. Andre’s long-held dream to explore the African continent was realised in 2002 when he spent 7 months travelling through most of the nature reserves in East and Southern Africa. It was on this adventure that Andre fine-tuned his use of the long forgotten medium of film. The discipline of using this medium was important in shaping his approach to photography, instilling the need to get things right in camera rather than in post-processing. These skills enabled Andre to master digital photography and its complexities with ease, allowing him to capture a mood or moment in the African bush. A rewarding spin-off of this African safari was winning the Mammals Behaviour Category in the BBC Wildlife Photographer of the Year competition in 2003, for the photograph of a wild dog chasing a zebra at dawn. Andre’s interest in captured motion on camera was born. His photographic style emulates motion and speed, showing glimpses of action, movement and behaviour not often noticed by the human eye. When most are trying to freeze motion, he is capturing it and slowing it down. Andre has had a number of his images published in magazines such as the BBC Wildlife Magazine, Weg and Getaway. 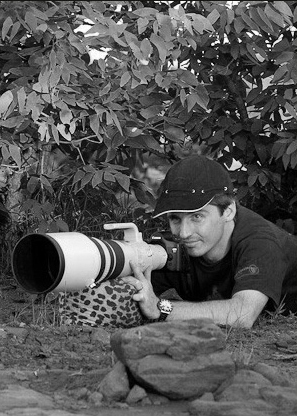 In 2005, Andre and his friend Shem Compion started a wildlife safari photographic company, C4 Images and Safaris. Their vision has been to take enthusiastic photographers, novice and experienced, to wildlife destinations with the best game viewing potential at ideal times of the year. They encourage their clients to be creative and assist them in learning a variety of photographic techniques. C4 has, over the past nine years, become the leading specialist photographic safari business in South Africa. They continue to push the boundaries of creativity and provide varied and exceptional destinations. Unique photographic hides and workshops in Mashatu, Botswana are also a great opportunity to learn more about wildlife and how to capture it on camera.